Stocking stuffers are one of my very favorite Christmas traditions. The sight of a Christmas stocking bulging with mysterious small objects just makes my heart go pitter-patter. As miniature collectors know, very great things indeed can come in small packages, and this year Santa outdid himself. MinToy was a Chicago based manufacturer of dollhouse miniatures in the 1940s-'50s. 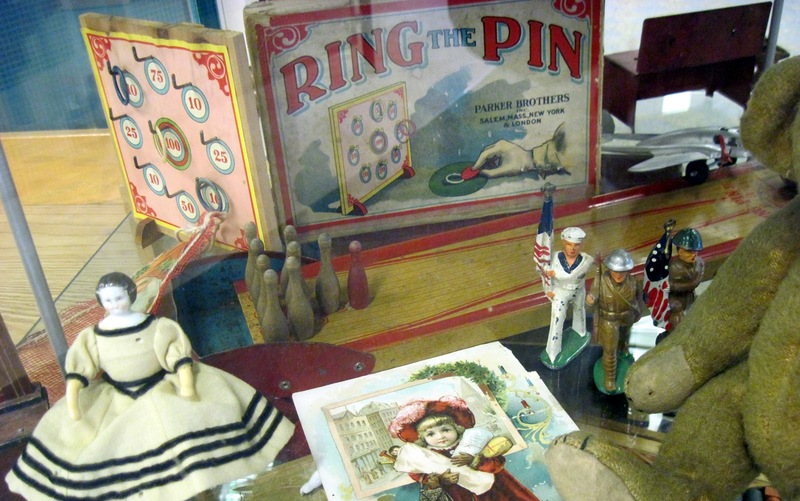 Their motto was "The Big House of Little Things," and they made very nice things indeed. This carded set of kitchen utensils measures 4 1/2 inches, while the itty bitty box of silverware is just 2 1/8 inches. 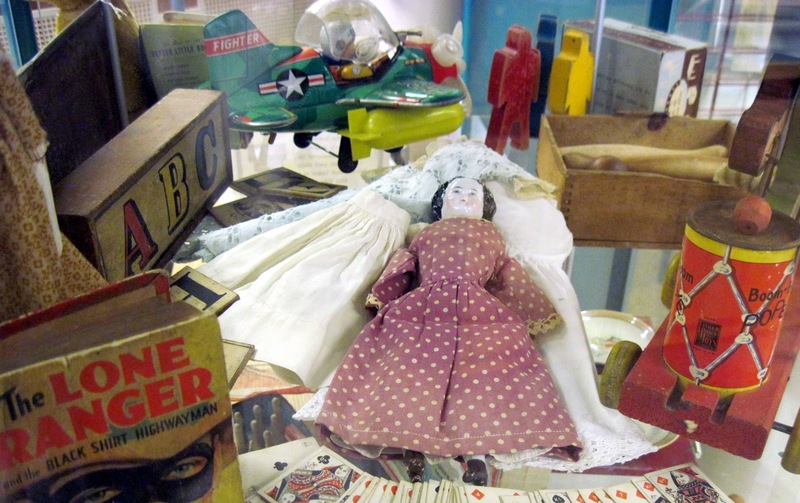 Little dollies in peanut shaped molded cardboard containers were a mini-fad in the 1920s and '30s. This Austrian-made version features a celluloid doll with her original glass baby bottle. The peanut is 4 inches long. This partial German dolly's tea set just delighted me. I love the colorful stripes, reminiscent of a circus tent. Circa the early 1900s-'20s, the teacups are 1 inch in diameter. This Old Maid card game dates from the 1920s-'30s. It features fantastic caricature art: click on the photo to see the cards in more detail. 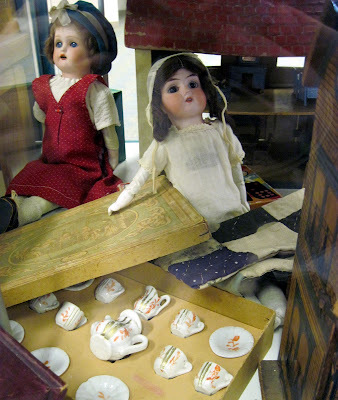 Lastly, a lot of wonderful old dollhouse cakes, dating between 1920-1960. Why all these dollhouse cakes? Because my biggest gift this year was an 1890s German dollhouse pastry shop or confectioner's. It needs a complete restoration, and then these cakes will fill its empty shelves...pictures to follow once it's all done! One of my favorite Christmas presents this year was this Bliss dollhouse from the early 1900s. The American made lithographed house is 11 1/2 inches tall, with the front opening to reveal two rooms inside, each with their original floor and wall papers. The two pillars, balcony, and "gutter" were originally lithographed too, but these papers have not survived. There's a lot of architectural interest to this little house, with its terracotta tiled roof, half-timbered construction, and oval leaded glass windows. For Christmas this year, I received a couple of old dollhouse shops, the circa 1900 German example described earlier, and this, a 1950s American model of the "modern" grocery store. Measuring a full two feet wide, it's made of wood and fibreboard, and came filled with many of its original products along with its cash register, check out counter, meat counter, and striped awning. Most of the products are made of wood, wrapped with paper labels. I'm especially intrigued by the "Snappy Brand Cheese" in a can: whatever was this like?! This Christmas I received one of my most long-sought antique toys: a "convertible" German platform rocking horse circa the early 1900s. The horse, made of a wool or brennessel type material over a carved wooden frame, stands 28 inches high, and still has his original saddle, bridle, and reins, along with his real hair mane and tail. The horse is mounted on a wheeled platform, which was then attached to a rocker base. It could be ridden as a rocker, or removed from the base and pushed about on its wheels. Don't you just want to take him for a ride? One of my most spectacular Christmas gifts this year was this antique German dollhouse shop, a general store circa 1900, measuring 18 inches wide. 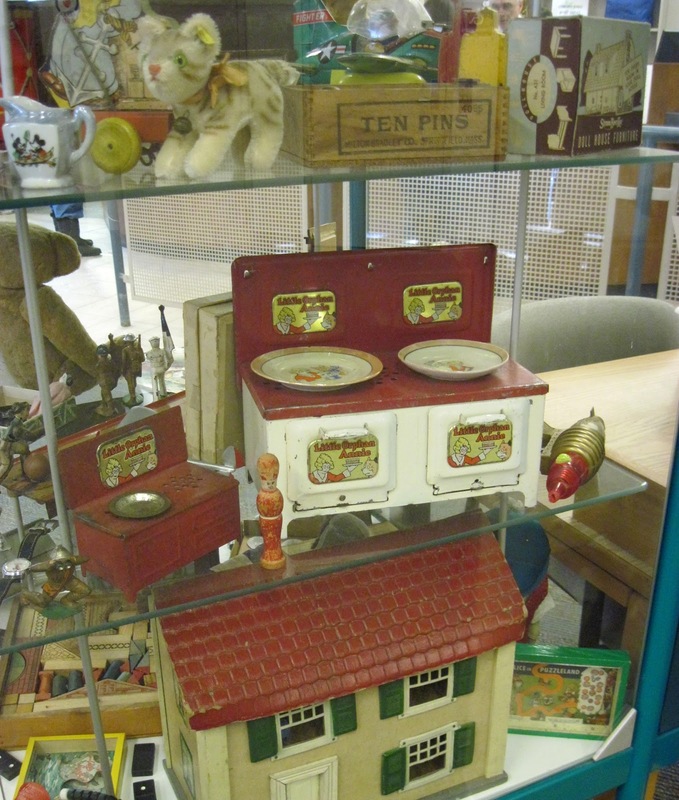 It has its original counter, tin cash register, drawers with tin labels (written in English for the American and British markets), floor paper, wallpaper border, and many old products and accessories. Recently, I found this tiny, 5 inch tall vintage aluminum Christmas tree, dating from the early 1960s. Maybe it was intended for a funky, modernist dollhouse. It's now the perfect size for my little Peng Peng polar bear. For those who have been tormented by my Christmas peek posts, the wait is almost over: only 5 days to go, and all will be revealed! 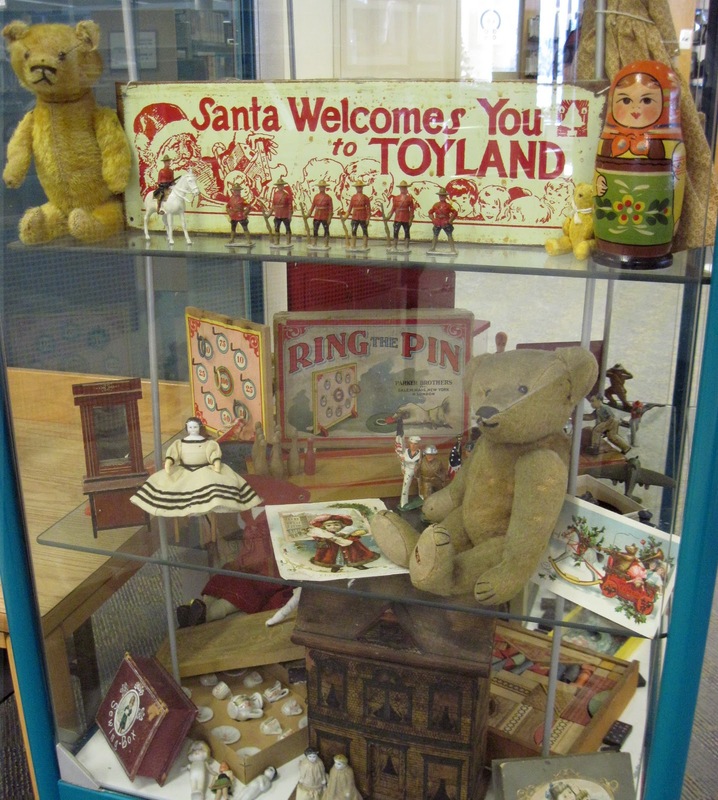 Here's a peek at an antique toy exhibit I just put in at my library for Christmas. Mounties and sailors and bears...oh my! Dollies and tea sets have always been great Christmas gift ideas. ...and a soldier, a sailor, ninepins, and a dolly. who appears to have fainted. The famous psychiatrist Eric Berne once said, "Human life is mainly a process of filling time until the arrival of death or Santa Claus." That's perhaps a bleak and rather reductionist outlook, but I have to admit, I do spend a lot of time looking forward to Santa's arrival each year. 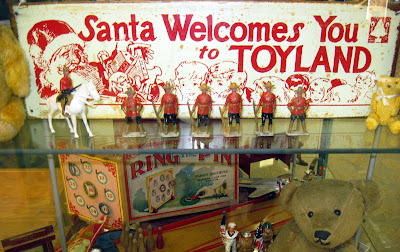 As a fan of the big guy in red, my holiday collections include a large assortment of Santa themed Christmas ornaments. In fact, my tree is decorated solely with Santa pieces, mostly in blown glass. I think I just like the tidiness and symmetry of a single decorating theme; but I suppose it's possible my Santa tree represents some subconscious "sucking up" to the great gift-giver himself. 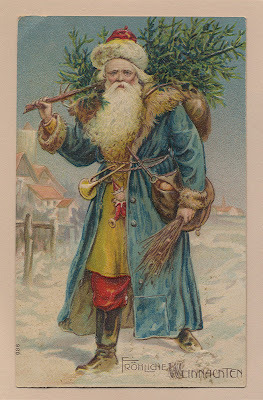 After all, what could be more flattering to him than an entire Christmas tree covered with representations of himself? Maybe my Santa tree inspires him to leave me extra presents. 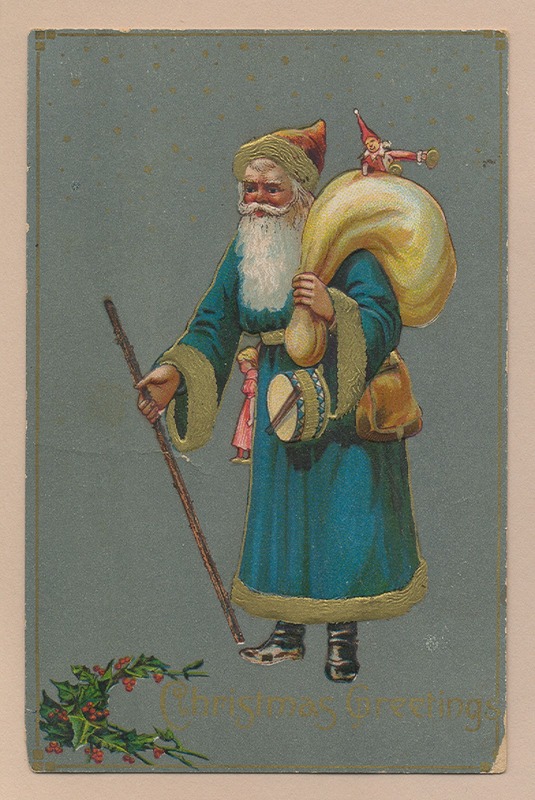 Christmas books for children comprised a very popular publishing niche in the Victorian and Edwardian eras. One of the loveliest I've ever found is this, Christmas Joys for Girls and Boys, printed in Bavaria by Ernest Nister Condon, and released in America by E.P. Dutton and Company, New York, around 1908. Thankfully the illustrations remain undamaged. 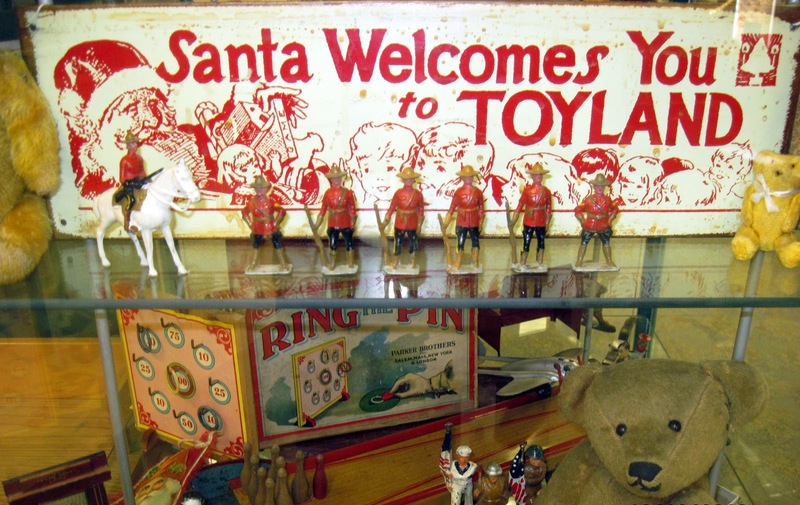 The gorgeous, richly colored full page spreads depict classic scenes of Christmas, with a profusion of toys. In the next illustration, children conduct their Christmas shopping by sled. 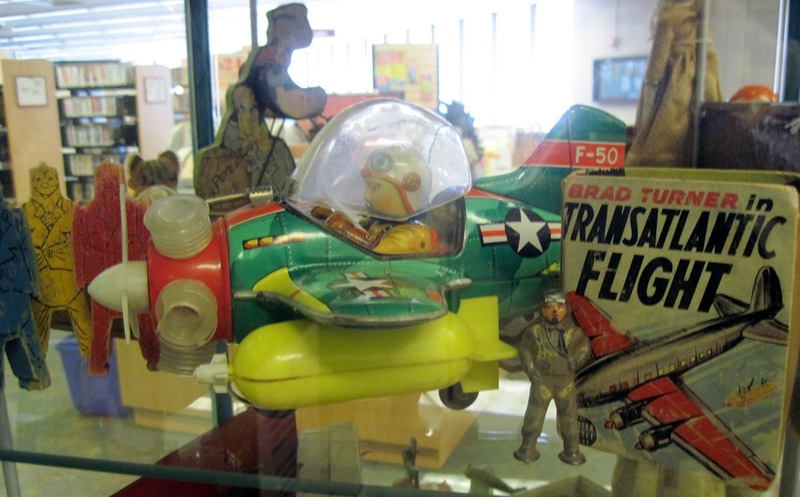 Check out their haul of wonderful toys! Page seven features "The Christmas Basket," a cornucopia of antique toy treasures to make the collector's heart flutter. I spy several dollies, a tin litho automobile and steamship, a train, and a platform horse!